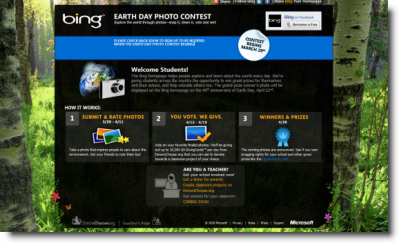 Get set for Bing's Earth Day Photo Contest! To celebrate Earth Day, Microsoft is looking for you to show them something you find inspiring about the environment. Your photographs can be of anything relating to nature, the environment, the “great outdoors”, and anything else you think relates back to Earth Day. For more detailed photo guidelines and other information, visit the Earth Day Photo Contest website.